Erika Svanoe's "Pride and Prejudice"
Jane Austen’s Pride and Prejudice encompasses many themes and mores that a modern audience can relate to, but the theme of love is most often used when others consider adapting her novel. Erika Svanoe utilizes this theme through her creation of Marrying Mr. Darcy, a game where players can put themselves in the context of the novel, and by coupling it with a new edition of Pride and Prejudice that explains her decisions. Svanoe’s cover to Pride and Prejudice presents Austen’s novel as a fantasy world which is available for those who wish to enter Austen’s world, both by reading Austen’s novel and by playing Svanoe’s game, Marrying Mr. Darcy. The cover to Erika Svanoe’s edition of Pride and Prejudice indicates that Jane Austen’s novel is about entering a fantasy world where you can achieve happiness and find love. The two main characters, Elizabeth Bennet and Fitzwilliam Darcy, are drawn facing each other. Darcy looks into Elizabeth’s eyes amorously, almost painfully. Elizabeth stares back, unsure of her own feelings toward him. In fact, this appears to be true at the climax of the novel, when Darcy explains his actions to Elizabeth in hopes of clearing up the misunderstandings that circulate about him. A very famous quote by Elizabeth encompasses her current state of mind: “Till this moment I never knew myself” (Austen 140). It is not until this moment that she comes to view Darcy differently, and eventually falls in love with him. The expressions on the faces of Elizabeth and Darcy are perfect illustrations of this point in the book. By including a drawing of such a scene on the front cover, Svanoe is predisposing the reader to expect a romantic plot. These expressions, plus the fact that they are illustrated in a semi-realistic manner, invite the reader to suppose that what they are stumbling upon is a fantasy, or a chance to “be Elizabeth, or see a bit of ourselves in one of the three Bennet sisters” (Svanoe 5). However, the cover reminds one of a graphic novel, yet this edition is anything but that. The illustration serves another function: catching the eye of a reader who might be looking to enter another world of Austen, both by re-reading her text, as well as playing Erika Svanoe’s game, which is effectively advertised at the beginning and end of the book, as well as through the notes she includes throughout the book. 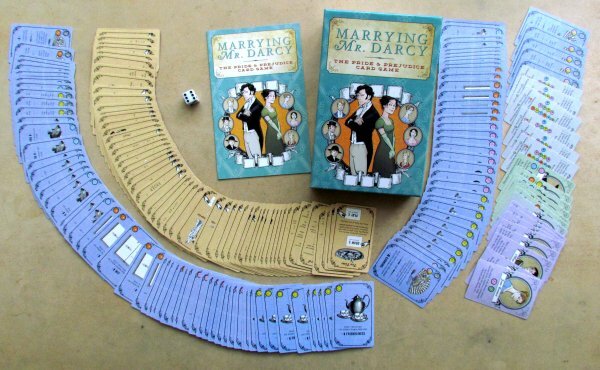 The game, Marrying Mr. Darcy, represents a fantasy in the novel: marrying your true love. Although the art style is a bit different from what is used for the game, the minimal resemblance is there. Furthermore, through the use of end notes, Svanoe explains the inspiration behind the different components of the game. For example, the first end note can be found on page ten when Mr. and Mrs. Bennet pronounce their favorite daughters. Through the Event cards, “Father’s Favorite” and “Mother’s Favorite”, Svanoe connects this plot point in Austen’s novel. After reading these end notes, the reader is subsequently drawn to Marrying Mr. Darcy. 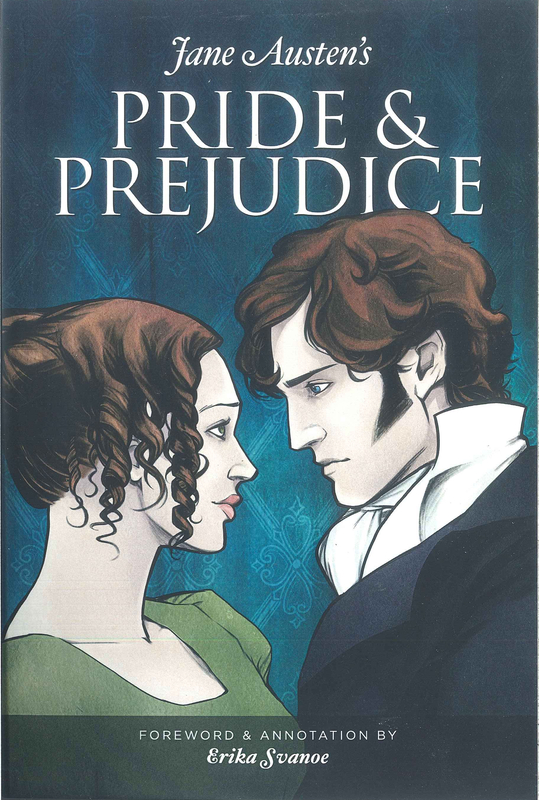 The cover of this edition of Pride and Prejudice not only signals the reader to associate themselves with a fantasy world full of love, but also encourages them to explore this idea further by purchasing the associated game, Marrying Mr. Darcy. Svanoe’s cover attracts Janeites who are always looking for more ways to connect with Austen and her characters through the timeless theme of love, thereby giving Austen’s text meaning. In the foreword to her edition of Pride and Prejudice, Svanoe describes herself as being “an Austen super-fan” who wished to make a game “that other Austen fans would want to play” (Svanoe 5). In Marrying Mr. Darcy, the players are able to play eight of the female characters in the book, all of whom seek happiness through marriage. Although there are a number of other themes which are prevalent in Pride and Prejudice, such as financial stability, first impressions, and social class, the theme of love has the power to thrive through many generations. For that reason, Marrying Mr. Darcy has been very successful—it allowed players to play for their very own happy ending. By coupling this game with an edition of Pride and Prejudice that gives insight into how Svanoe designed the game, as previously mentioned, the readers are allowed to become more familiarized with Svanoe and Austen’s text by reassessing what the different parts of the novel mean. When playing the game, a player might reflect on how a certain situation affected the fate of a character in the book and base his/her decision on that. For example, there is a card that suggests that your suitor has “Many reasons for marrying,” which means that the player can “re-roll the die one time during the Proposal Stage or the game since their suitors have multiple reasons to consider joining them in matrimony,” which is certainly the case with Elizabeth in the novel (Svanoe 260). Svanoe’s edition and her game play off of this theme, thus allowing readers to live vicariously through the characters in the book and interact with Austen’s theme of love. Svanoe’s edition of Pride and Prejudice is an interesting one, for it both promotes Austen’s text and Svanoe’s adaptation, Marrying Mr. Darcy. Adapting Austen in such a way proves how versatile Austen's work truly is, and encourages readers to interact with her novel in different ways, such as through the medium of play. Austen, Jane. Pride and Prejudice. Foreword and Annotation by Erika Svanoe, Evensen Creative, 2014. Svanoe, Erika. End Notes. Pride and Prejudice, by Jane Austen, Evensen Creative, 2014, pp. 257-64. Svanoe, Erika. Foreword. Pride and Prejudice, by Jane Austen, Evensen Creative, 2014, pp. 5-6. Svanoe, Erika. Marrying Mr. Darcy. Designed by Erika Svanoe. Evensen Creative, 2013. Board Game.